use coupon code: HEXA20 | Ends Soon, Hurry! A Fun New Way to Preserve Your Memories! Nothing can be more precious than the moments spent with loved ones, the priceless expressions and emotions that splatter through the photographs we captured at that particular moment. Yes, that’s how we keep treasuring our most loved moments to date. But not anymore. 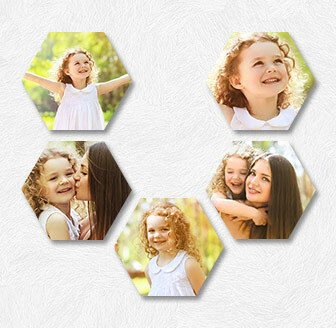 We introduce you to hexagon shaped canvas prints that will help you relive your loved moments creatively and forever. We, at CanvasChamp, are determined to serve yours with best ways to live your special moments for years ahead. 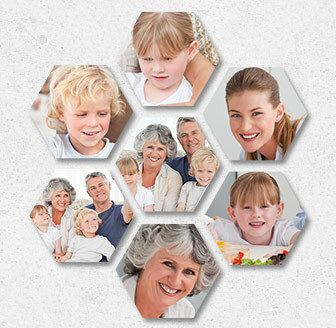 To ensure that you get best quality hexagon prints, we utilize world-class printing technology. Talking about customizing options, you can add extra effects to your pictures and can from three different borders and two different wraps. 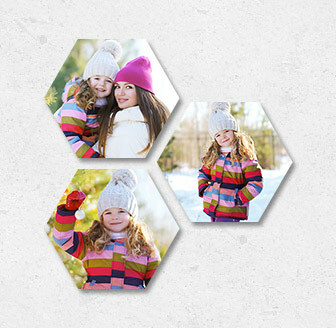 Our hexagon shaped prints will indeed grab the attention of your guests flawlessly. 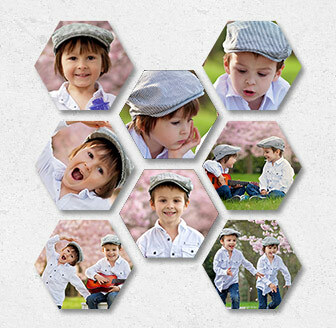 With the help of our dedicated design tool, you can easily customize your hexagon shaped canvas prints. 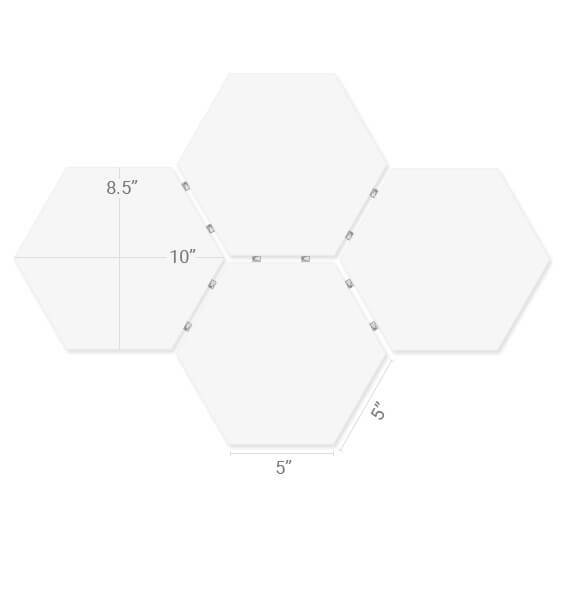 Our hexagon prints measure 8¾" from side to side and 10" from corner to corner. 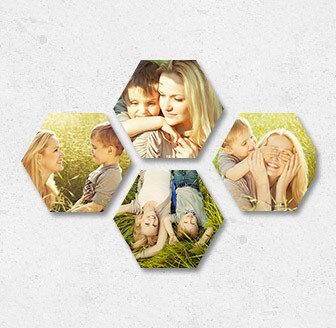 Having said this, you can hang an individual hexagon canvas or can use them together to form a distinct group of hexagon prints that narrates a unique story. Easily upload your images from using your laptop, smartphone, or social media accounts. 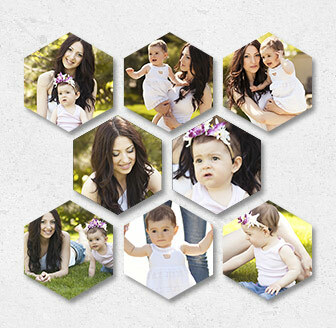 Crop and place your picture to make it fit perfectly in the hexagon shaped canvas. Choose your preferred wrap and border. Customize it further using additional finishing options. Print as much you want together or add to your cart individually. 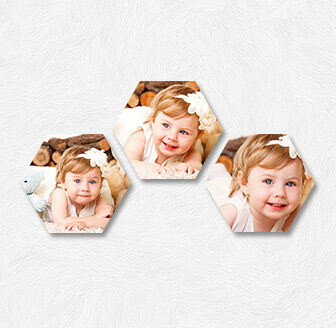 The wraps and borders play an important role in adding to the overall beauty of your hexagonal shaped canvas prints. Our customers, love the .70" wrap the most, as it gives the 'gallery-touch' to overall hexagonal print and your photograph. You can scroll through a variety of wraps and border options to give distinct look to your overall print. 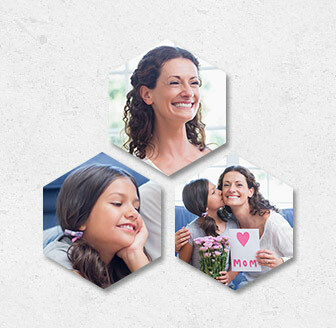 With CanvasChamp you'll never run short of options to personalize your hexagonal shaped canvas prints. Our color finishing options include sepia, grayscale, and other artistic ways to make your photograph look more appealing. Also, you can request for retouching. Here our experts will remove any form of scratches, redeye, fixing color fade, or any other issue related to exposure. 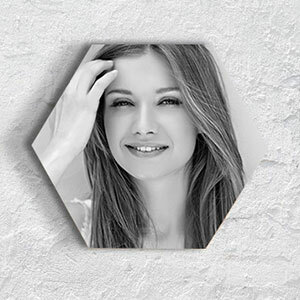 The team will be executing this using professional tools so as to avoid any negative impact on your original image and further to ensure that your receive best through your hexagonal canvas prints.